On December 15, 1969, John and Yoko launched the War Is Over campaign! In December of 1971, they recorded the Christmas song Happy Xmas (War Is Over). The simplicity of the lines in his Happy Xmas drawing are the essence of Johns lyrical message. And so this is Christmas. We hope you have fun. The near and the dear one. The old and the young. For weak and for strong. For rich and the poor ones. John has drawn people gathering together in front of a Christmas tree; the weak; the strong; the rich and the poor. With a minimum amount of lines, he has captured the feeling of Peace that settles each figure in his sketch. His message is clear Lets stop all the fighting. Yoko repeated the peace campaign in December 1998 by placing the mesage in Times Square, NYC. For the holiday season, I wanted this to be a gift to you from John and I. Hand-Pulled silk screen Serigraph in three colours. Brand X Editions, New York. Framed (Gallery Frame As Is). 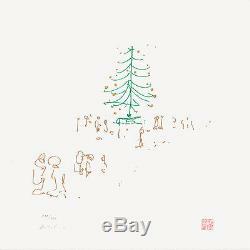 The item "John Lennon Limited Edition Print HAPPY XMAS Signed by Yoko Ono, Framed" is in sale since Sunday, May 6, 2018. This item is in the category "Entertainment Memorabilia\Music Memorabilia\Rock & Pop\Artists B\Beatles\Other Beatles Memorabilia". 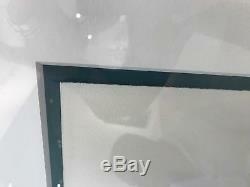 The seller is "animazingsales" and is located in New York, New York. This item can be shipped worldwide. 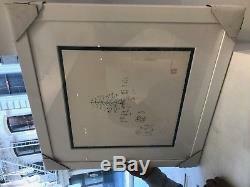 FRAME SIZE: 25" X 25"